Dr. M.V. 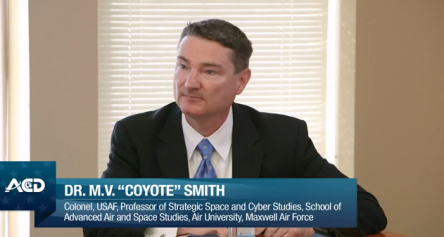 “Coyote” Smith, Colonel USAF, Professor of Strategic Space and Cyber Studies, School of Advanced Air and Space Studies, Air University, Maxwell Air Force Base: on –Welcome to the Age of Cyber & Space Warfare. ACDemocracy briefing on Energy security, EMP, Cyber/Space Warfare,ACD director Dr. Rachel Ehrenfeld, organized and moderated the meeting .